1-st International air athletics championship. Федерация воздушной атлетики России. Международное сотрудничество. IMCN.Ru - пресс-релизы, новости, мероприятия, предложения, аналитика, консультации. Мероприятия. Опубликовано 12.08.2018 10:42 Просмотров всего: 91071; сегодня: 14. 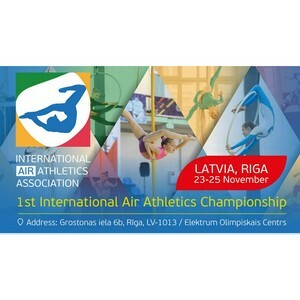 The International air athletics association holds an international team tournament in three disciplines of air athletics: aerial silks, aerial hoop, pole sport. The tournament is hosted according to the rules of the International Air Athletics Association air athletics. Obligatory exercises in the disciplines of athletics are specified in the appendix of the International Air Athletics Association. Rules, reception and execution of documents, the tournament is held in two languages - Russian and English. National teams of national federations or national teams representing the country are allowed to participate in the tournament. Applications for participation in the tournament are accepted only from representatives of teams (strange or national federation). A representative of the national team organizes the work and is responsible for preparing and organizing the team's trip to the tournament. The team consists of participants who emerge in the individual competition (solo or in a group) in any or several disciplines. The International air athletics association undertakes the organization of the tournament and helps in the invitation and accommodation of participants, the conduct of the broadcast, the production of award attributes, the preparation of information materials and publications. The winner is determined in the individual competition for each discipline in his category. In the team event the total number of prize places is taken into account, the team that has won the highest number of top prizes wins. Number of participants in the team is not less than 10 people.